At Mindful Care, there’s a whole lotta lovin’ goin’ on! Mindful Care is a 5-day-a week program, operating in donated space by New Vision Baptist Church in Murfreesboro. The program welcomes people who have mild Alzheimer’s and other compromised memory issues. While Mindful Care is not affiliated with a particular religious tradition, the organization is dedicated to extending love and compassion to those age 55 and up. Operating from 8 a.m. to 5 p.m., Mindful Care gives family caregivers a much-needed break during the day and, in some cases, the ability to continue employment. 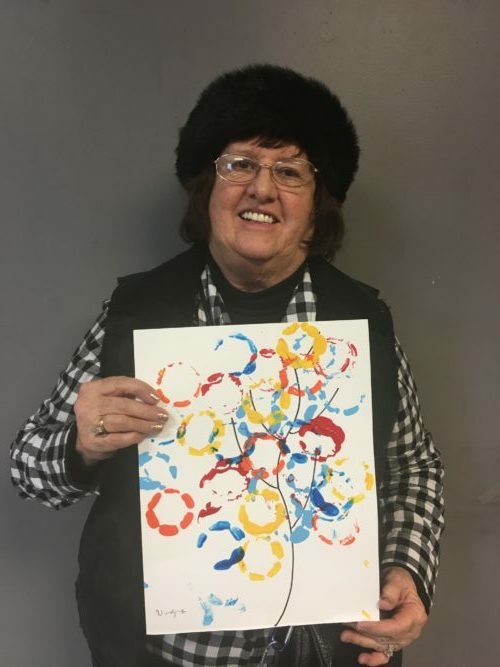 Wanda Kennedy shares some of her artwork. “Mom just absolutely loves going there,” says daughter Karen Yonge. “She calls everyone ‘sweetheart’ at the program. She loves on everybody.” As Karen and her mom were leaving the program one afternoon, one of the participants remarked, ‘Thank you for sharing your mom with us.’ “You can’t put a price tag on that,” Karen said. Wanda was born and raised in Oklahoma. When Karen was 4, her parents—her dad also taught school—decided to relocate to California where teachers could make a better living. The family lived there for 40 years. Karen described her mother as a caretaker. Wanda met another man some time after who was in the middle of a divorce. He and his wife had lost a child the same year Karen’s father was killed. “They bonded over their grief,” Karen said of her mother and her gentleman friend. “When I was expecting twins, he was all excited about being a grandpa. I didn’t know a lot of older people who had boyfriends—it was weird. I told him if he wanted to be called ‘grandpa,’ he needed to marry their grandma. They were married after dating for 13 years.” The man was an alcoholic, Karen added, which “put mom in some physical and emotional danger. But she’s tough and lived through it.” Coincidentally, Wanda’s second husband also was killed in a motorcycle accident. Karen explained that with three daughters looking forward to college, she researched Tennessee and learned how many universities there were. When they visited the state, her husband interviewed for a teaching job. Eventually they moved to the Volunteer State and brought Wanda with them. They have lived in Murfreesboro for 10 years. “It’s beautiful here, the pace of life, the people, it’s great,” Karen said. She teaches at La Vergne Middle School and her husband teaches at Blackman High School. Every couple of months Karen arranged for her mother to visit family in Oklahoma. In 2013, Karen went to the Nashville Airport to pick up her mother who was returning from one of her visits. Her mother did not show up. What was supposed to have been a brief visit to Oklahoma turned into a 3 ½-year separation from her mother, which, for many reasons, caused a huge and lasting rift between family members. During that time, Karen had very little communication with her mother. Through her cousins, Karen learned that her mother was unhappy and wanted to go back to Tennessee. Following prolonged court hearings—Karen’s cousin had become Wanda’s legal guardian—Wanda returned to live with Karen and her family. About seven years ago, while visiting in Oklahoma, Wanda started slurring her words and was diagnosed with encephalitis. She was semi-comatose for several days in the hospital. It affected her short-term memory, Karen recalled. “Her memory was stuck in her teenage years. She has gained a lot of her memory back and has shown even more improvement in the last year.